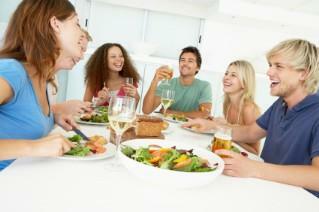 Showing your appreciation for the good food and company is customary when you offer a dinner party thank you. While most people realize that they need to thank their host(s), they may get confused when it comes to figuring out the right way to give thanks. Guests at semi-formal or formal dinner parties often bring a host or hostess gift as a way to say thank you for the invitation to the party. It is polite to offer to bring something, such as dessert or a side dish, when you respond to a party invitation. Of course, you are under no obligation to offer a dish-after all, the reason the host is having the party is because s/he wants to host. If the host or hostess takes you up on your offer, you do not need to bring anything else. If the dinner party is at a restaurant or is catered at a location other than the host's home, skip asking whether you can bring an addition to the dishes being served. Even if you do bring a small gift for the host, you should still remember to thank him or her after the dinner party ends. Let the host know how much you enjoyed the food, appreciated the invitation, enjoyed your dinner companions or had fun playing the games after the dinner. Choose an aspect of the party that stood out and emphasize it in your thank you. How you go about giving the host a dinner party thank you depends on the formality of the evening itself. For example, if the host went to the trouble of writing a formal invitation letter, you should send a handwritten thank you note on sophisticated stationary. Use clues from both the dinner party invitation wording and the party itself to help you choose how to give your thank you. The respected Emily Post Institute states that a thank you should be made the next day. However, in most casual or informal situations, you can usually wait a day or two before you become lax in giving out a thank you. Choose a similar medium for saying thank you to the host as s/he did in inviting you to the dinner party. If the invitation was made as you both were getting the mail, feel free to wait a few days until you see the host in person to thank him or her. Similarly, if you received a phone call or email invitation, feel free to pick up the phone or jot a quick email thanking the host for the party. After a formal dinner party, send a thank you promptly, preferably the next day, as Post recommends. Choose formal stationary in a style similar to that of the invitation card. Compose your message on a piece of scrap paper before transferring it into the thank you card. Use your best handwriting for a formal thank you. Address the envelope by hand, and either write your return address by hand or use an appropriate label. Remember to add the proper postage, as larger, square or otherwise oddly-shaped mail requires additional post. A dinner party thank you is a polite way to let the host know that the party was a success. Use cues from the party's formality to determine the best way to send your thanks after the evening ends.